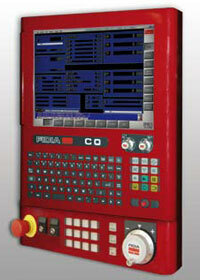 New CNC Controls | Fidia CNC Controls | Machine Tool Repair and Sales, Inc. Compact, flexible and low cost numerical controls designed for a wide range of applications in the field of the machine tool. Based on a common platform both controls uses the same FFB bus ( Fast Field bus ) to connect the XPOWER drives and the I/O LUX modules, the same 15" touch screen monitor, the same pushbutton panel and the same IEC1131 standard software for the PLC applications. F0 is the basic system with single processor and Linux operating system. The extended ISO funtions are suitable for programming mechanics machining in a simple way. 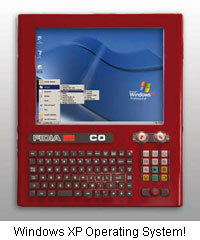 C0 is provided with an additional CPU for running the Windows XP Professional operating system and then having the possibility to install all the most powerful Fidia software as ISOGRAPH and HIMILL, and any other software compatible with Windows, including the Profibus DP interface. C0 is the system suitable for machining moulds, dies, aeronautical parts and general complex and fast machining. handle tool radius compensation in any plane with automatic re-machining of residual material.